2009 marks thirty years since Ridley Scott's film Alien was released. Alien remains one of the most classic and influential science fiction movies ever produced... and it has not only held up against the test of time, it's one of the few films of the genre that actually seems to get better with each passing year. 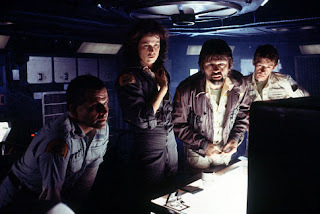 GeekTyrant has posted a fine retrospective of Alien, including some thoughts and observations that had never occurred to me before, as well as lots of trivia that will now doubt come as new information to many people (like how H.R. Giger's designs for the Facehugger were held up by alarmed U.S. Customs agents at the airport, prompting writer Dan O'Bannon to drive on over and explain that they were meant for a horror movie).